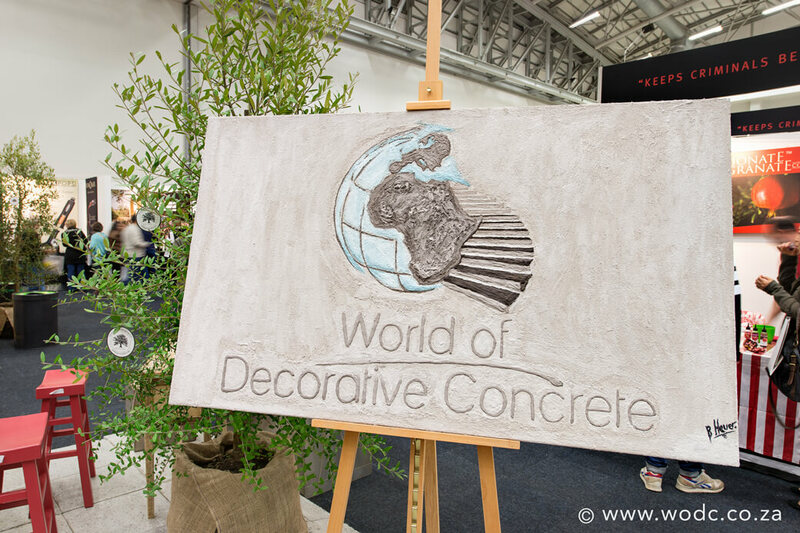 The Homemakers Expo 2015 definitely raised the pressure for Stucco Italiano and World of Decorative Concrete. 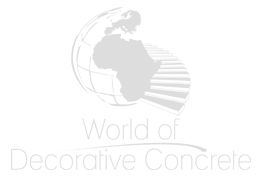 However, we accepted the challenge to showcase our products – some eye-raising ones among them – as well as our newly launched nomenclature and logos at the same time. 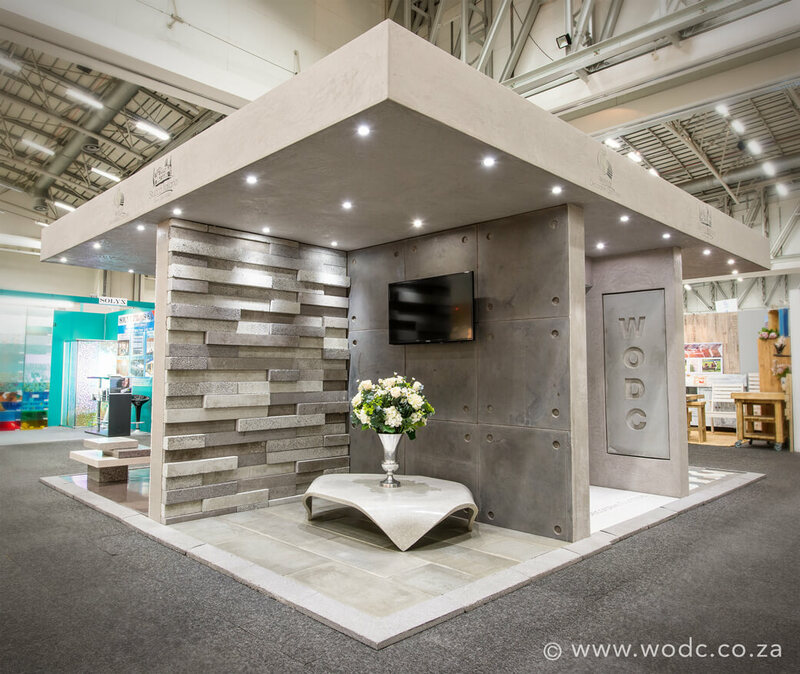 Our first aim was to make quality our stand-out feature, but also to be regarded as among the very best displays of excellence at the 2015 Homemakers Expo. 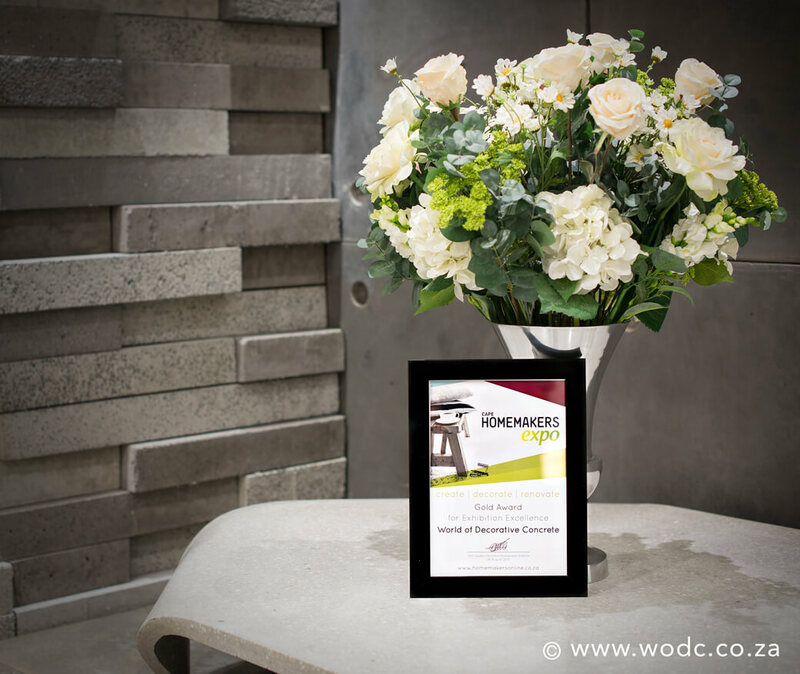 Our efforts were handsomely rewarded with a Gold Award for Excellence. 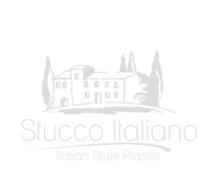 It is never easy to properly present products and services, as well as our brand philosophy, in such a small allocated space. 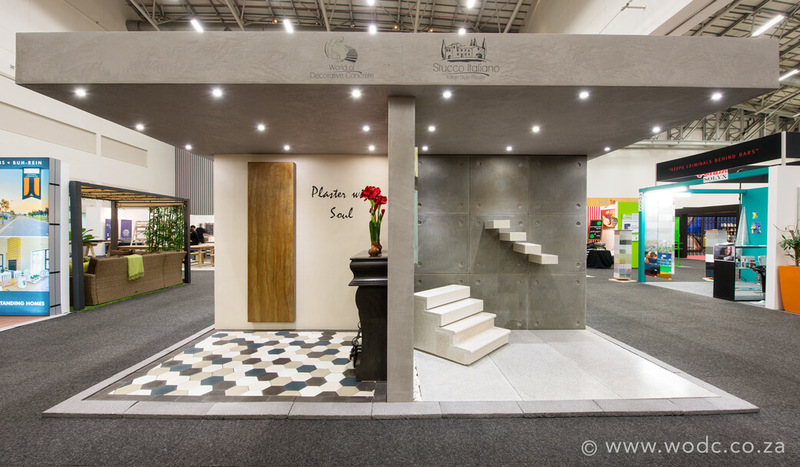 Realising that even the interested visitor only spends a maximum of 15 minutes per stand, we had to showcase concrete as a product of excellence and prove that our concrete products differ from the rest…… namely Concrete with Soul. 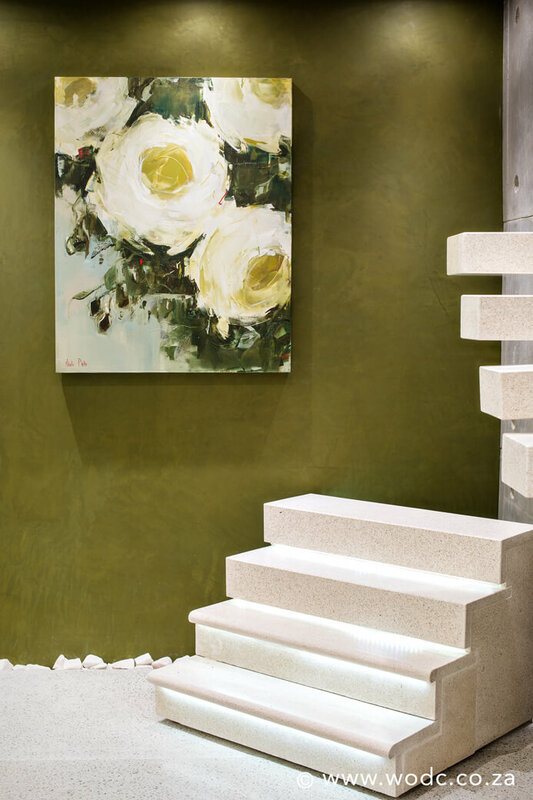 We chose to show products mainly in art format. 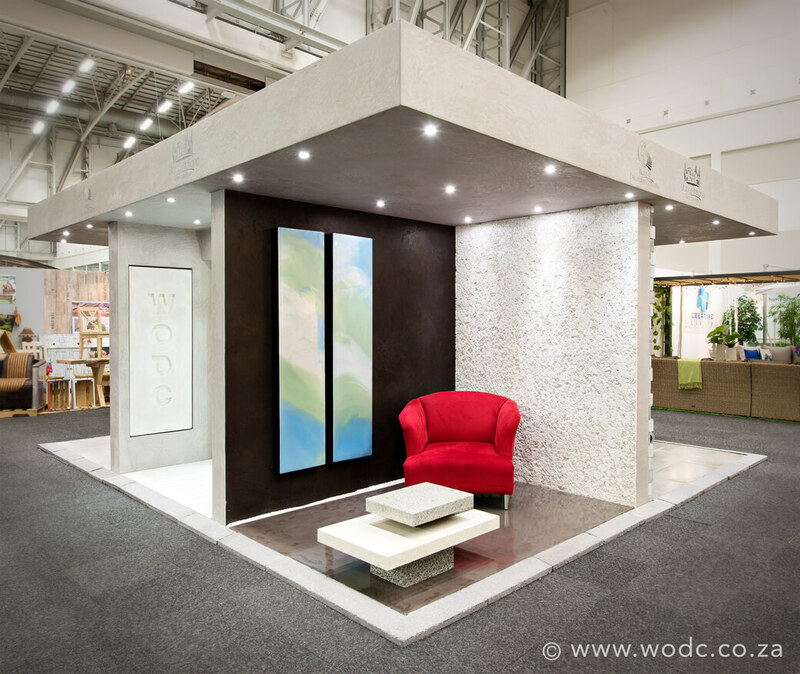 The design of our stand aimed to convey the compatibility between our different products and the ability to encompass all the different design styles. 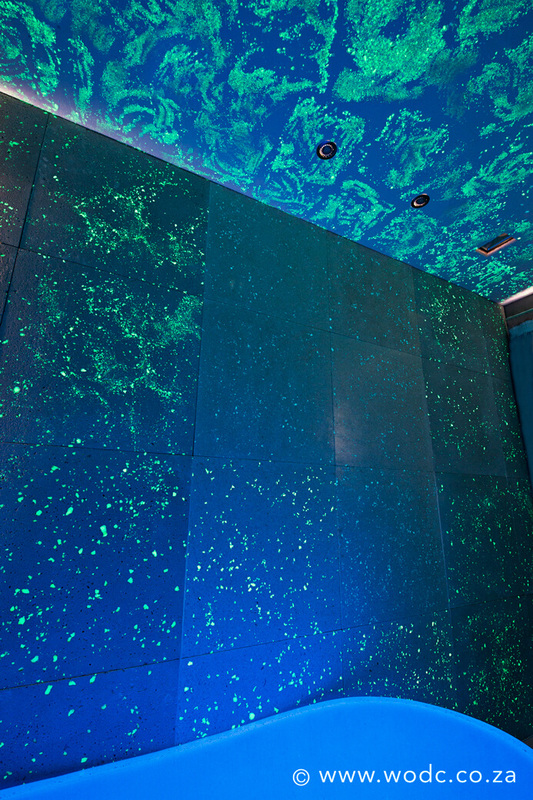 Stucco Italiano’s luxurious “Stucco Delight” Epoxy Floor finish was displayed against a black Tadelakt wall as two decorative artistic wall pieces. 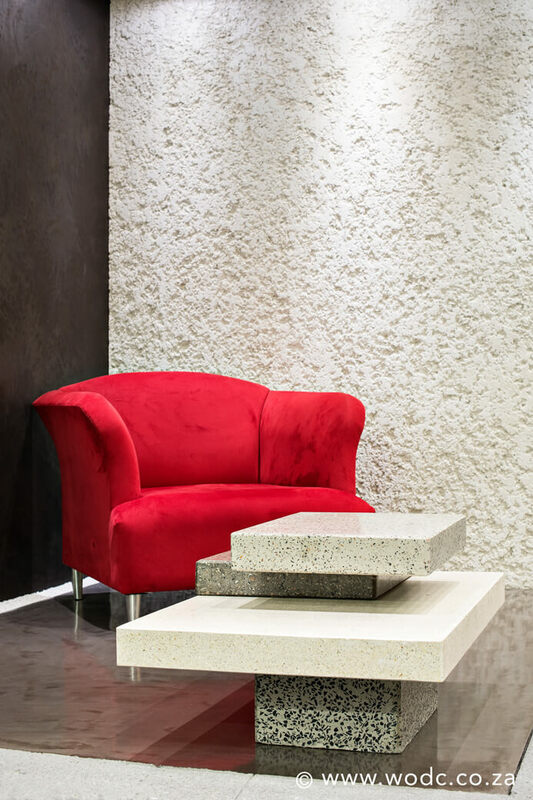 The contemporary precast concrete coffee table complemented the white decorative plastered wall which was created by using a special plaster technique. 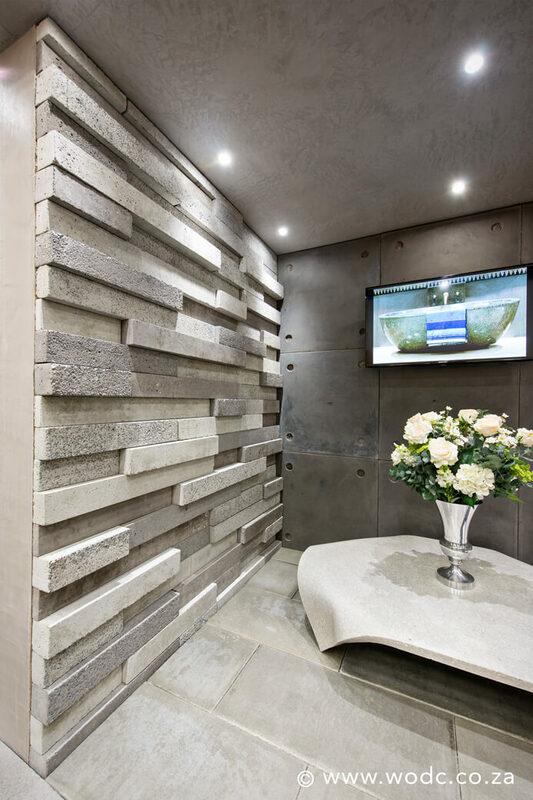 Our Off Shutter Lightweight Concrete wall panels were showcased for the first time. 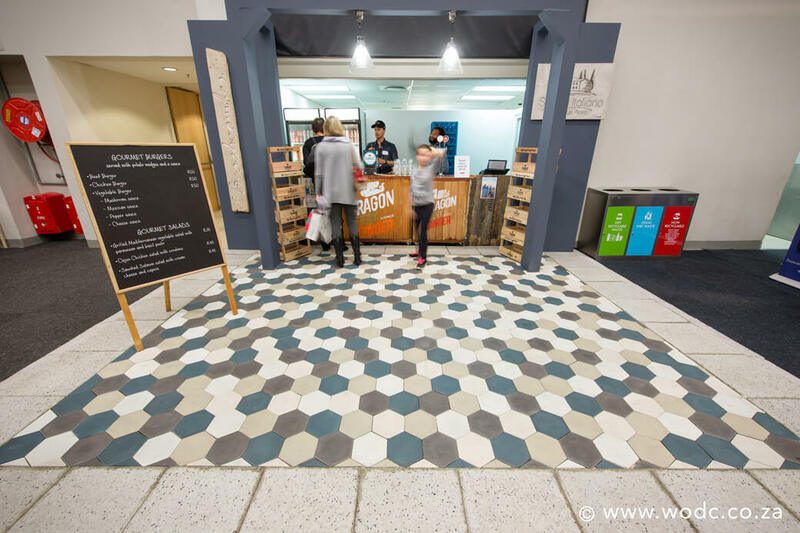 We highlighted the charcoal Off Shutter Lightweight wall panels as wall cladding, complemented by different precast concrete strips, placed horizontally onto the adjacent wall, and finished the floor with grey Off Shutter Concrete floor tiles. 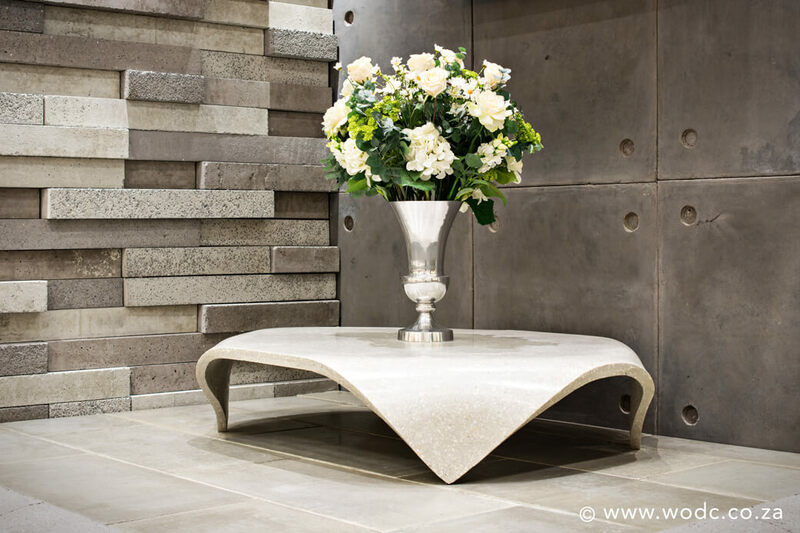 These wall and floor finishes, were in turn enhanced by a very futuristic bendable precast concrete coffee table. 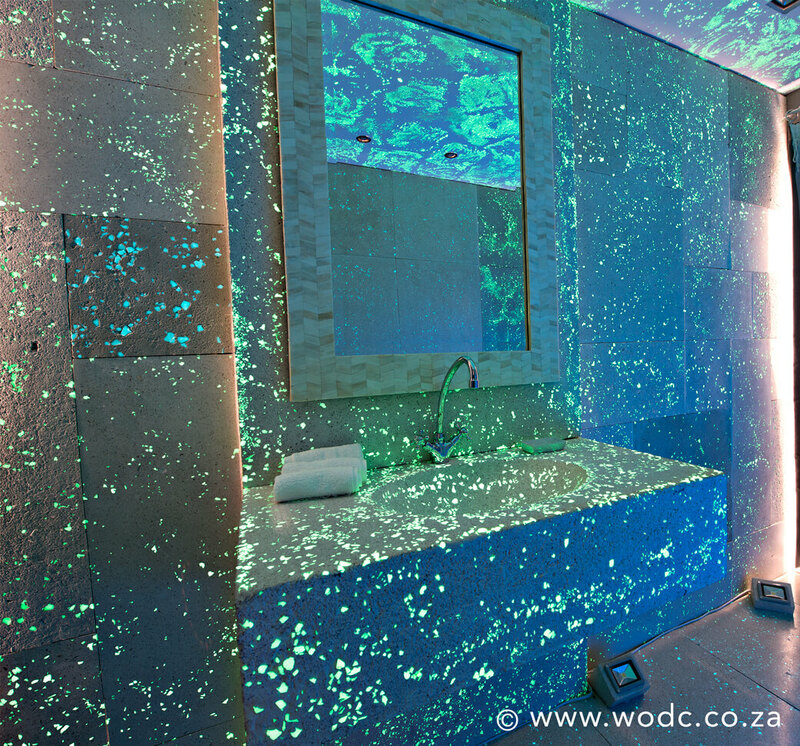 These combinations of finishes seemed quite popular and certainly became a “show stopper” for the visitors. 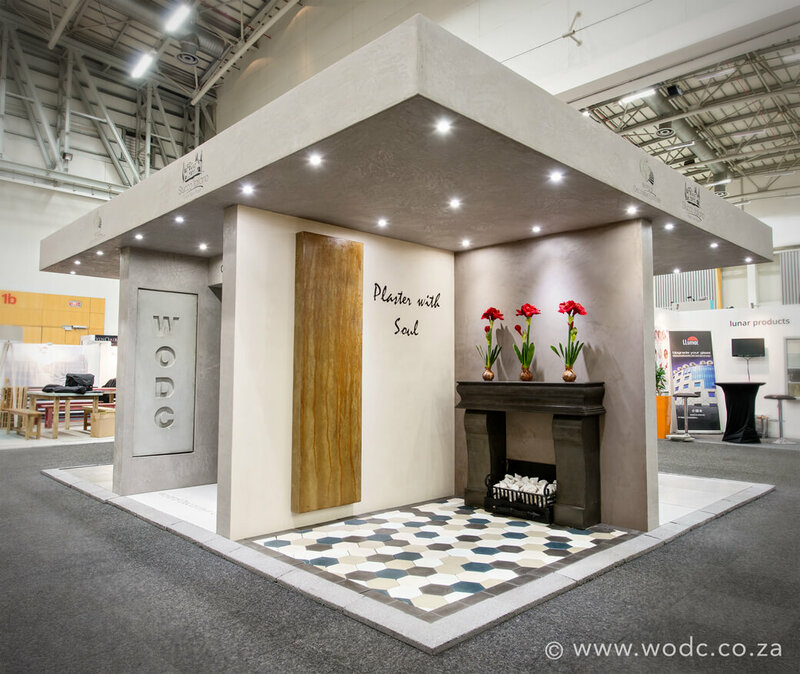 Another classical and stylish part of the stand proved to be our newly launched hexagonal cementitious floor tiles in various colours, combined with our very popular Stucco Italiano AquaGuard Wall Plaster, with a precast fireplace surround placed against it. 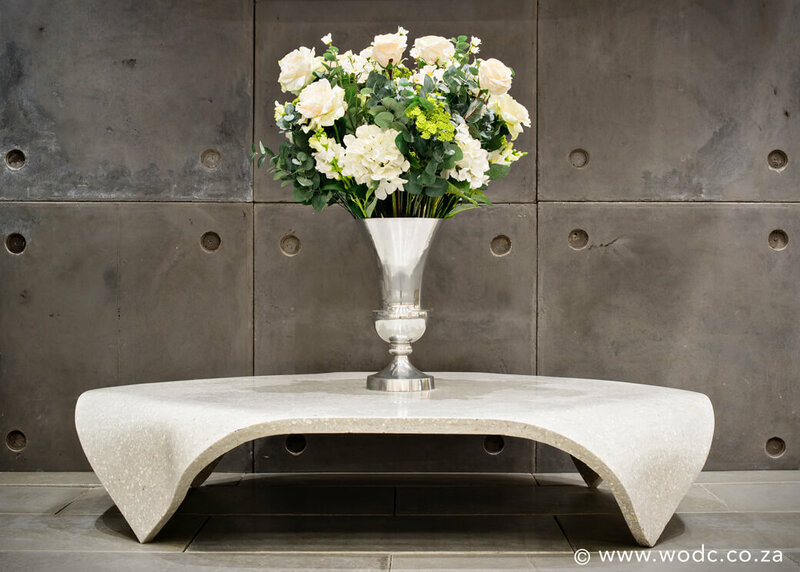 Our Polished Concrete Floors and Precast items were displayed as precast polished concrete floor panels, showing different surface finishes, combined with grey Off Shutter Lightweight wall panels. 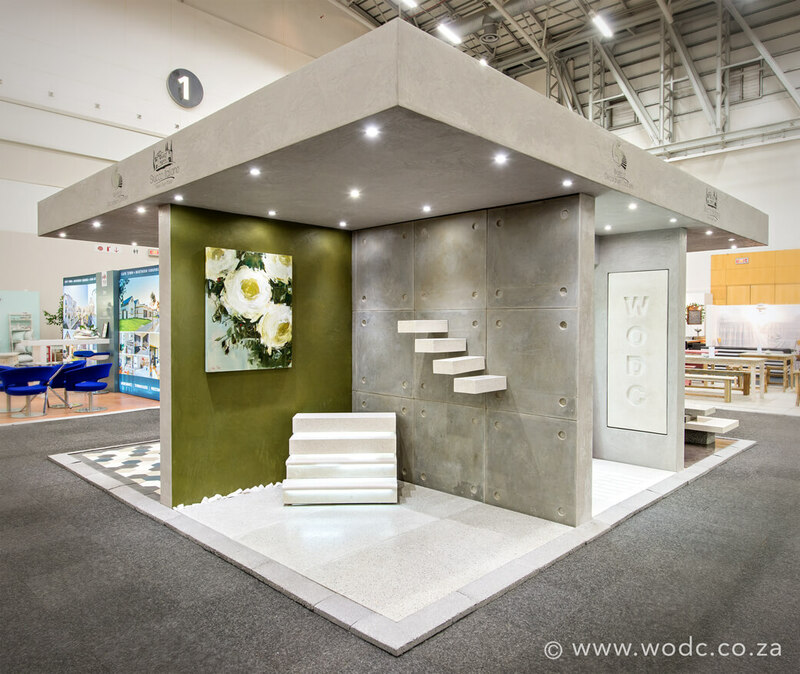 Precast polished concrete floating stair treads and precast polished concrete stair claddings were displayed in this corner of our stand. 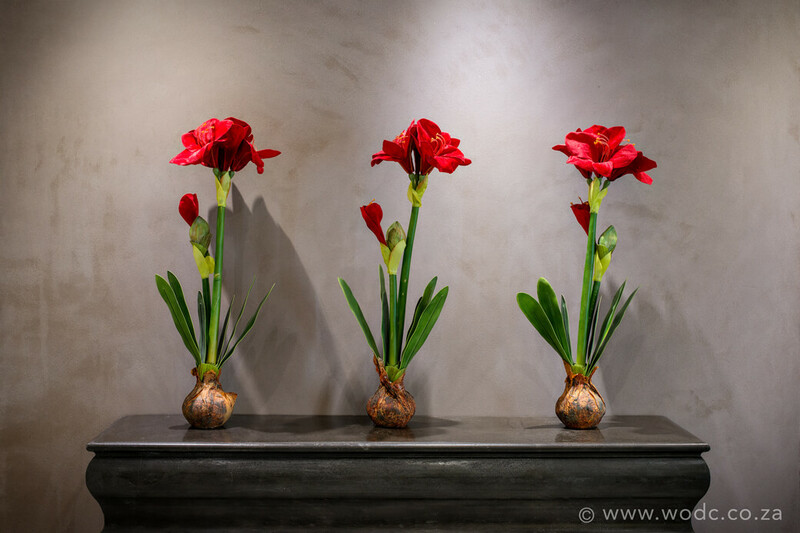 An exquisite Nicole Pletts painting from Lindy Van Niekerk Art Gallery enhanced the beautiful green wall, plastered with the colour Palmerie from our Tadelakt range. 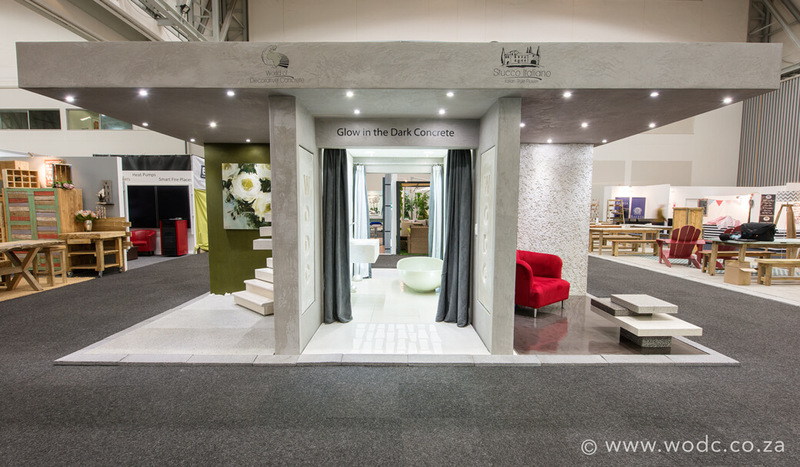 The highlight – not to use the word lightly – of our stand, was undoubtedly the “Glow in the Dark Concrete” displayed for the first time in South Africa at this scale. 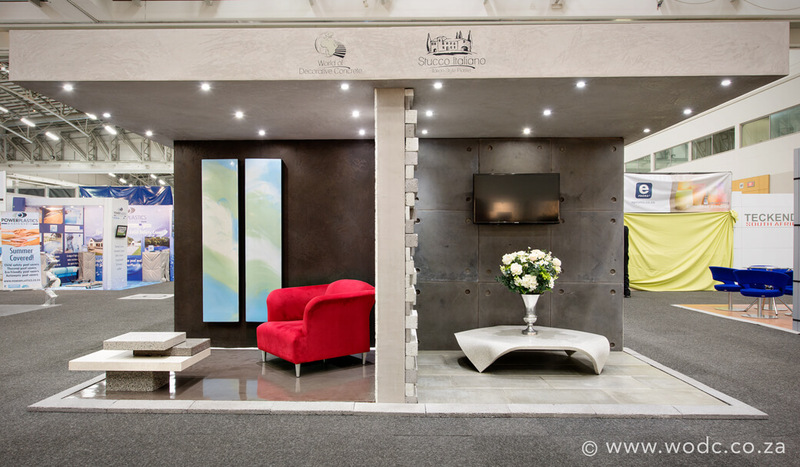 To quote numerous visitors ….”a must to see” …..”something different” …..”best display at the Expo” …ext. 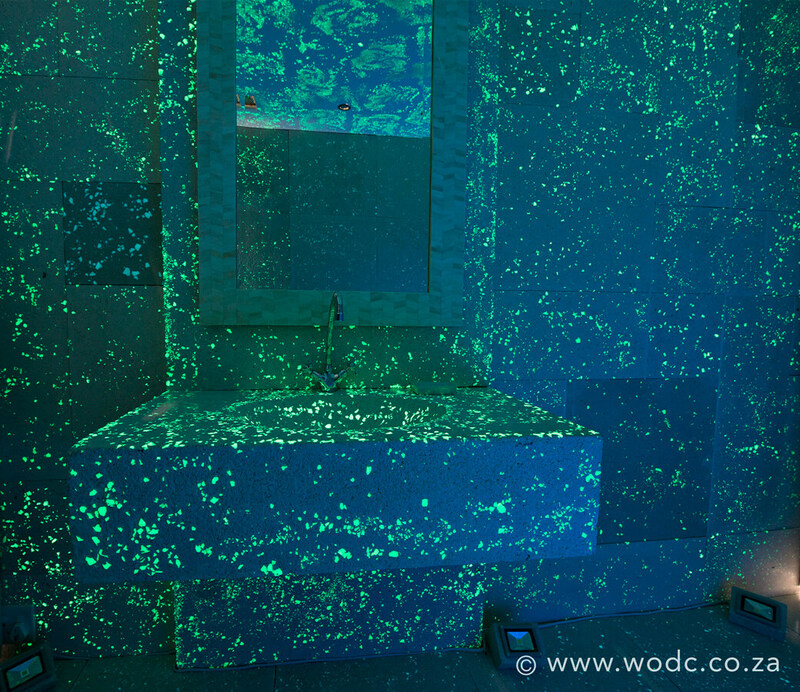 This luminous Glow in the Dark Concrete is very new in the concrete industry. 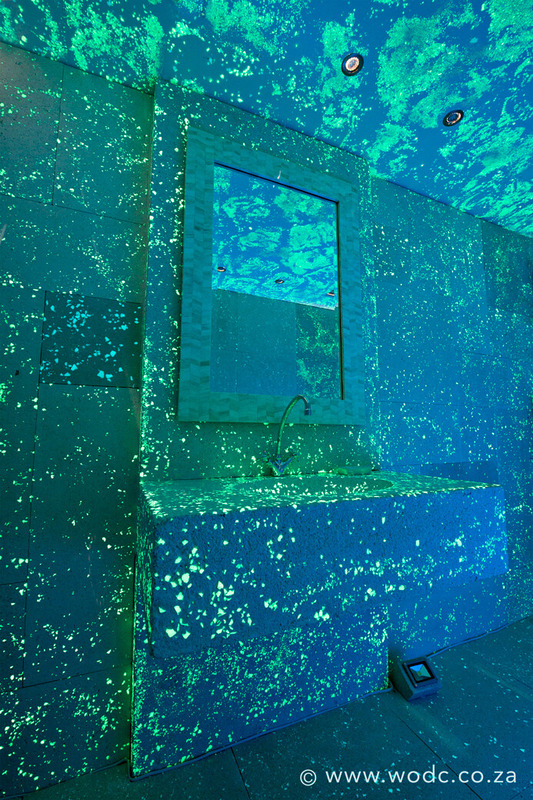 We elected to show this in the form of a complete bathroom to give visitors a real sense of how the product could look and create atmosphere in a home. 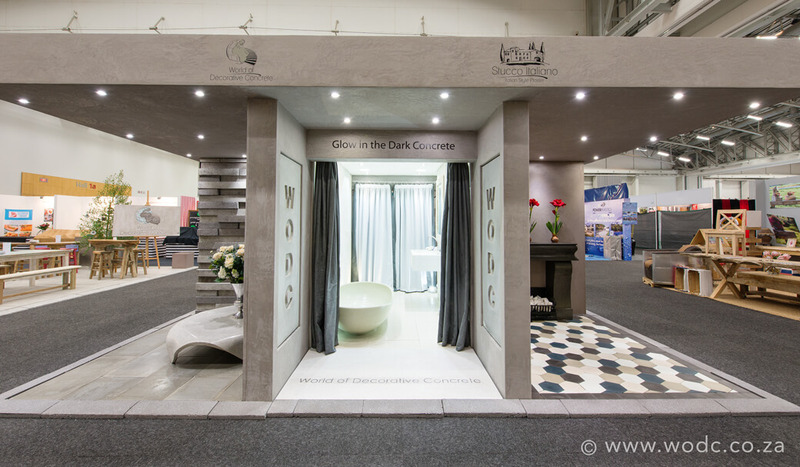 The Homemakers Expo 2015 was one of the best Expo’s we were privileged to be able to participate in, from the large numbers of visitors to the quality of visitors and enquiries about our products. 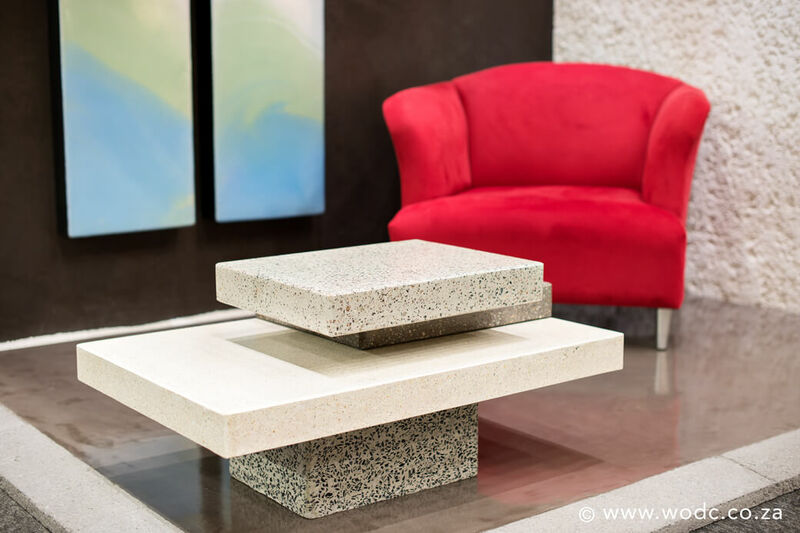 If there ever was any doubt , the Expo once again made it clear to us that concrete is among the most well known and durable building materials of all time. 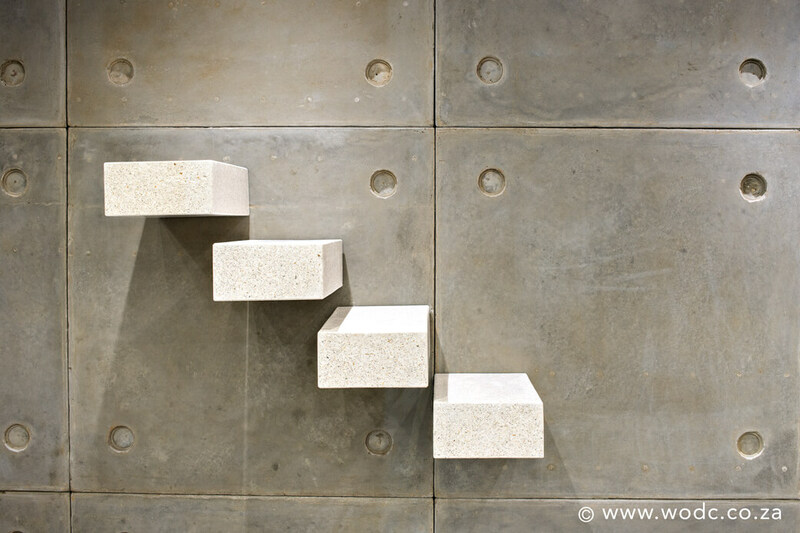 Concrete as a decorative building material, is timeless, a trend-setter that will remain in fashion for a long time to come. 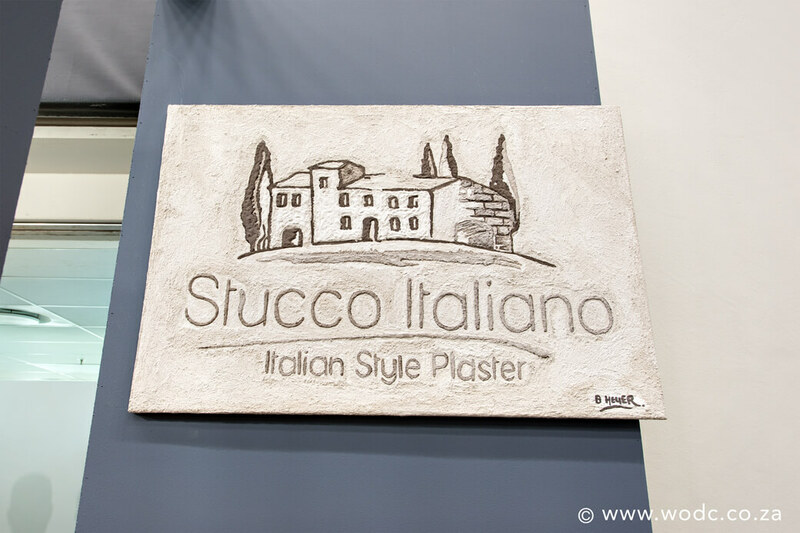 Beverley Heuer, one of our very artistic staff members, took on a quite difficult task by painting our brand new logo’s with Stucco Italiano AquaGuard Plaster onto canvas and it was also exhibited at the Homemakers Expo.